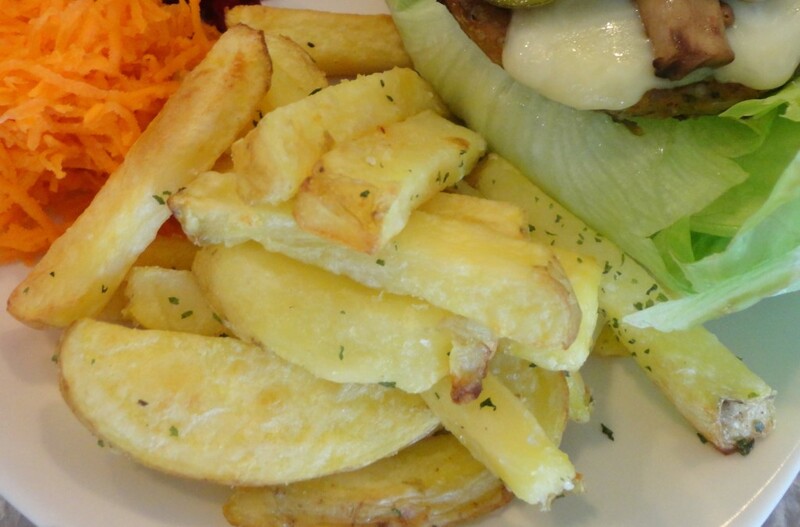 Ah, Crispy French Fries…why doth though forsake me? No more! I think I have found a way to make yummy, crispy, fresh outta the oven French Fries! That’s a big thing for me because sometimes I get this mega-huge craving for the dang things and, yea, try and find a fryer out there that is not cross contaminated with poultry or seafood! Impossible! Except New York Fries but they seem to have gone the way of the Dodo bird. The thing that worked for me was to par boil the cut fries, drain ’em and let ’em lay on a clean kitchen towel for about 15 minutes before throwing them in a bowl, tossing ’em with some olive oil, turning ’em out onto a parchment lined baking tray and firing them into a HOT oven for 20 minutes, stirring after the first 10 minutes. When I took the hot lil babies outta the oven I tossed them into a bowl, sprinkled with coarse salt and a lil chopped parsley, and voila! Crispy on the outside and yummy on the inside! In large pot of boiling water, par boil french fry-cut potatoes for 2 – 3 minutes. Drain in colander and turn out onto clean kitchen towel to dry completely, blotting with another clean kitchen towel if necessary. In medium size mixing bowl, combine dry, par boiled french fry-cut potatoes with olive oil and toss to coat all potatoes. Turn out, in a single layer onto prepared baking trays. Bake for 10 minutes; remove baking trays from oven and stir fries. Return to oven and continue baking for another 10 minutes or until a lovely golden brown. Remove from oven, tip fries into large mixing bowl, sprinkle with coarse salt and chopped parsley; toss to coat all fries. We made this at school a few weeks ago and I was eager to try it at home. I used Chef Nathan’s presentation method but used a different recipe for the stuffing. I tweaked the recipe a bit and added garnishes. Please feel free to hop over to the original Zucchini Boat recipe. Line a baking tray with parchment paper; set aside. In saute pan, on medium-high heat, heat olive oil. Add diced shallot and cook for a minute or two. Add diced garlic and continue cooking for a few minutes. Add finely diced reserved zucchini pulp. Add diced mushrooms and cook until mushrooms are softened, about 10 minutes. Remove from heat and add balsamic vinegar, bread crumbs and parmesan cheese; mix thoroughly. 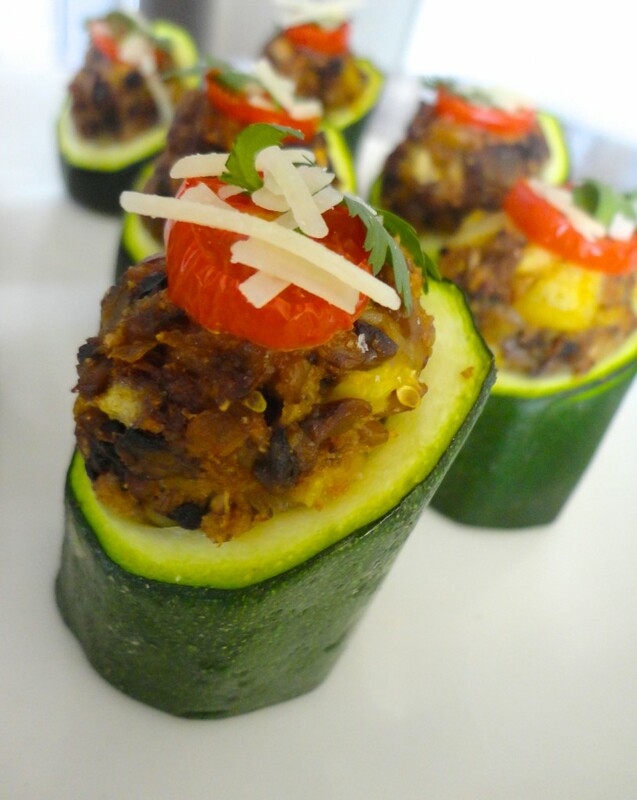 Spoon equal amounts of stuffing into each zucchini cylinder; top each with a slice of cherry tomato. Remove from oven, garnish with fresh cilantro and a sprinkling of parmesan cheese.